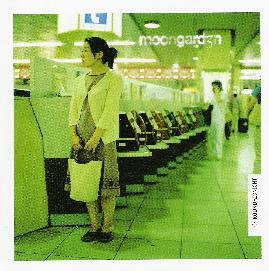 From all accounts, this is Italian group Moongarden’s fourth album, and is somewhat different from their previous releases. I haven’t heard their previous efforts, so I’m writing this somewhat in the dark. What I hear is a band with strong instrumental chops and good song writing abilities, but not much of a desire to really push forward musically. The music on Round Midnight falls firmly in the realm of neo prog, a genre I feel is sort of at the point where traditional prog rock was by the early 80’s; that is, in dire need of something to revitalize it. In 1983, Marillion came along, shortened and simplified the excess of 70’s prog into a tighter, more commercial sound with decidedly un-cosmic lyrics, and so was born neo prog. Twenty some years later, neo prog bands are still pumping out stuff that sounds like Marillion. And such is the case with Round Midnight. Taking their cue from mainly the early Steve Hogarth era of Marillion, with dashes of the Fish era and vague hints of Genesis, Moongarden’s music is pleasant on the ears, with plenty of strong melodies, some nice guitar work, and even some passages featuring Mellotron, giving it a bit more of a classic feel. I just didn’t find it too terribly original sounding. One track that did stand out for me was the longest track on the album, Learning to Live Under the Ground. With its heavier guitars, spacey Mellotron, and arpeggiating keyboards, it was like symphonic prog meets progressive metal and had a different sound and feel to it than the rest of the music on the album. Also, I thought the lead singer’s voice worked better with this heavier style than it did on the mellower pieces. Now I’m not a huge neo prog fan, so if you are, you may find a lot more to like here than I did. I did enjoy the shifting dynamics, nice acoustic passages with more orchestrated, heavier stuff, and the use of the Mellotron was a nice touch, but I generally prefer music that stretches the boundaries of what is considered progressive a little more than Round Midnight did. For more information you can visit the Moongarden web site at: http://www.moongarden.it. Visit the Galileo Records web site at: http://www.galileo-records.com. Contact via snail mail c/o Galileo Records; c/o Patrick Becker; Alpenstrasse 22; 2540 Grenchen; Switzerland.